Heritage meets the future is a project combining a conference and workshops, organized by Nordic Textile Art and the Icelandic Textile Association, ITA in connection to the annual meeting of NTA that takes place in Iceland in March 2019. The project will occur at the same time as DesignMarch, HönnunarMars, the annual design event in Reykjavík. This is a great opportunity to involve textile artists and designers with cross disciplinary groups of people. The registration is open 12.12 2018 - 22.2 2019. The registration is closed. Är du intresserad av att delta, maila info@nordictextileart för att höra om eventuella restplatser. Textile artists and designers are in constant flux with their heritage, bringing it into their works and using as an endless source of inspiration. Iceland has a long tradition of working with textiles and have a unique kind of wool that is the main source of Icelandic textile material. At one time woven cloth was even one of the biggest export of the country. Today, artists and designers in Iceland are working on methods and ways to continue developing textiles in Iceland. Now is a time where it is important to share information, to learn from other countries and discuss our future vision, while discovering new textile technologies. How we see the future in terms of textile art and design in the nordic countries. Please don´t hesitate to contact us if you have have questions. info@nordictextileart.net. Du kan skriva till oss på íslenska, "skandinaviska" eller engelska. Harpa lecture hall 9:00 - 16:00 Full day of design lectures, part of the DesignMarch program. 18:00 Formal opening of DesignMarch 2019. Friday 29.3 - Textile tour to the south of Iceland. 9:00 - 16:00. Bus from Reykjavík to the south of Iceland. On this trip the aim is to introduce to Nordic textile artists and designers what is being done in Iceland. The first destination is minimill where new machinery has been set up to develop new kind of yarn and to experiment with the spinning and the process of Icelandic wool and Icelandic Cashmere. Uppspuni is one of the few minimills in Scandinavia where the whole process of wool yarn is being developed. From shearing the lamb until spinning the final product. Þingborg, is the next destination, a place run by local craft women who are working with Icelandic wool in natural colors. They process the wool with hand, shearing, processing the wool and handspinning yarn. The trip will include the “Golden Circle” Geysir, Gullfoss and the National Park, Þingvellir. Do you rather stay in Reykjavík, there will be a lot of events on DesignMarch. During the day there will be openings, exhibitions and happenings at DesignMarch. 10:00 - 15:00 NTA conference at VEROLD - The house of Vigdís. Jessica Hemmings "The Textile Art of Tomorrow"
Bryndís Bolladóttir "Functional Art - The sheep in me"
Katrin Þorvaldsdóttir "Aspiration for equilibrium"
Kadi Pajupuu "Hacking the Weaving Tools"
Isabel Berglund "Textile surface - identity"
Kiyoshi Yamamoto "Conversation with Annie Albers"
13:00 Brunch and networking hosted by the Icelandic Textile association. During the day there is the possibility to swim or to visit Korpa, The old milk factory where the Icelandic Textile Association has their studio, workshops and exhibitions. On the way to Blönduós we will stop at HESPA in Borgarfjörður. Guðrún Bjarnadóttir will lecture about her methods of plantdyeing. Workshops: 15:00 - 18:00 Textile Center Blönduós. 1: Working with Icelandic wool, including spinning. 3: Sewing into the Vatnsdæla Tapestry. Workshop 1. Traditional Icelandic wool working and spinning. In this workshop participants will learn about the characteristics of Icelandic wool and the basics of the traditional methods of wool-working. General aspects of wool quality in different sub-races of sheep. Tog vs. þel: Þel(thel) is Icelandic word for the soft inner coat and Tog is the Icelandic word for the stronger and longer outer coat fibers. Natural colors and artificial dying properties. The traditional methods to convert the fleece to yarn- selecting different fibers for carding and spinning. Instructor: Ásthildur Magnúsdóttir is a skilled spinner and a weaver. She is a teacher at the Textile department of Reykjavík school of Visual arts. Workshop 2. Working with horsehair. In the workshop you will learn to spin out of horsehair. Horsehair will be already prepared for spinning and the fibers of the tails are long and strong. We will use simple tools and work in groups two and two together. The tool used is a “Maðman spindle”. First it is twisted to spin a strong thread then the next step is to twist three or four singles into a stronger three or four strand thread. A multi twister is used in the final step to create a thick rope from the thinner ropes. This tradition of working with hairs is a very old craft. The energy of the twist makes a complete rope in the very end. Instructor: Lene Zachariassen is a Norwegian artist who has been living in Iceland for many years. She has mastered many of the old craft traditions, including working with horsehair, traditional tanning methods and crafting from animal products including bones and wool. Workshop 3. Vatnsdæla Tapestry- Bayeux tapestry embroidery. Vatnsdæla on a Tapestry is a ongoing project at the Textile center in Blönduós. Guests and artists are invited to participate in the making of the tapestry and embroidery a part of it using the Bayeux technique of embroidery. The full length of the tapestry will be 46 meters and today 18 meters have been completed. Included in the workshop there is a lesson in the Bayeux technique of embroidery. The Vatnsdæla tapestry is modeled after the Bayeux-tapestry which was sewn in the 11th century. The goal of the project is to revive the Vatnsdæla saga in a modern way, while using the old traditions of hand craft. The name of every person who embroiders or supports the project will be recorded in book which will be kept with the tapestry. Instructor: Jóhanna Erla Pálmadóttir is the director of the Icelandic Textile Center in Blönduós and the author of the Vatsndæla Tapestry. She graduated from Haandarbejdets Fremme, Copenhagen 1988 and since then has she been working on various projects related to textiles. ‘Threadlegs’ were sheep leg bones used as bobbins for handspun sewing thread. This style is called "læstur þráðaleggur" or locked thread-legs with decorative binding and was often used as gifts when visiting friends or family. In the workshop there will be a brief introduction of the history of the old Icelandic Threadbone technique. Participants will be shown how the wool is prepared and spun to make yarn for the bone. Each participants gets a bone and some wool and learn the old method. Instructor: Guðrún Hadda Bjarnadóttir is a textile artists who is known for using traditional and old craft methods in her work. In this workshop participants will be introduced to the Icelandic color knitting technique intarsia or rósaleppaprjón. Participants will get a pattern to knit and they will learn this old technique. Each participant will bring it’s own knitting needles #3,5 or #4 and the yarn will be supplied in the workshop. Instructor: Hélène Magnússon is a leading knit designer in Iceland. She has both the Icelandic and French nationality but was brought up in France. Her passion for textiles led her to extensively research Icelandic knitting traditions. She is the author of two important patterns books about Icelandic knitting: Icelandic Color Knitting: using rose-patterns brought back to life the unique Icelandic intarsia as seen in old shoe-inserts and Icelandic Handknits. In the workshop there will be a brief introduction on the tablet weaving technique. You will learn to make tools that are used in this technique. You will weave a mini sample of simple and double tablet weaving. 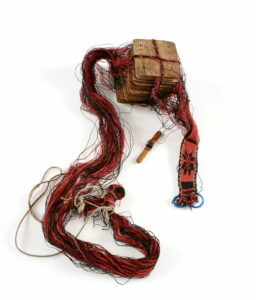 If the time allow, Egyptian tablet weaving will be introduced. Various material will be introduced, and you can also bring your own material. Instructor: Ragnheiður Björk Þórsdóttir is a textile artist, weaving instructor and researcher, living in Akureyri. She has been a weaving instructor and running her own weaving studio in Akureyri for 30 years. Last two years she has been working on a weaving research project at the Textile Center in Blönduós, where she has digitized over 1500 weaving samples and patterns for online textile database. Jessica Hemmings - The Textile Art of Tomorrow. Philip Fimmano - Archeology of the future. Philip Fimmano is a contemporary fashion and lifestyle specialist, contributing to Trend Union’s books, Bloom magazine and strategic studies for various international brands. He works in industries as varied as fashion, interiors, beauty, food and retail. In 2011, Philip co-founded Talking Textiles with Lidewij Edelkoort, an ongoing initiative to promote textile awareness and innovation through touring exhibitions, a trend magazine, a student prize and educational conferences. He is also a curator of contemporary design exhibitions for international museums, and has spoken about art and design at institutions such as Musée du Quai Branly in Paris and Nordiska museet in Stockholm. Philip currently mentors the Forecasting Masters at Polimoda in Florence. Bryndís Bolladóttir - Functional Art - The sheep in me. Bryndís Bolladóttir is a textile designer and artist who runs a production studio in Reykjavik, Iceland. She is inspired by architecture, design and art which reflect her interaction between functional and visual installations. Playfulness is important to her through different setups and through different functions of the same idea. Bryndís uses Icelandic materials in her work which is also inspirational to her approach in design. Bryndís is an award-winning designer and has exhibited and sold her designs to several private homes and to public places in Iceland, Denmark, Sweden, Finland, Norway, Germany, Netherlands, Canada and USA. She was collaborating with the Danish design company Normann Copenhagen with part of her KULA collection. Katrín Þorvaldsdóttir - Aspiration for equilibrium. Katrín Þorvaldsdóttir is an artist with a passion for seaweed. She has been using seaweed as a material in her art since returning home to Iceland in 1993 after studying and working as a puppeteer in Spain. She started using seaweed to make masks and puppets, and experimented using seaweed in scenography and costumes. In order to continue working with seaweed as a material for design it was clear that it was necessary for her to undertake more serious research to find out how it could be processed in a sustainable way. Her main reason for using seaweed has always been to work with a natural material while avoiding using chemicals. “With nature all around us in Iceland it is the most natural thing to use what we already have at hand, in a “circular” way - to give back to nature what we take from it, that is the main challenge facing us all today. "My vision is to give the coming generation the opportunity to work with nature in a sustainable and profitable way”. Kadi Pajupuu - Hacking the Weaving Tools. Kadi Pajupuu Associate Professor, Pallas University of Applied Sciences. Her invention Rail Reed is an adjustable weaving reed allowing to change the warp density and fabric width while weaving. Stepping reed is an attachment to normal reed that enables to push weft yarn in waves while weaving. Together with Marilyn Piirsalu, Kadi has been giving Rail Reed courses in Estonia, Finland, Sweden and Netherlands. Railreed is used by inventive weavers in USA, Japan, Australia and Africa and Europe. In 2016 I entered a Hackathon in Tallinn– a competition where you pitch your idea in front of the engineers and try to gather a team of 4 members that will help to build the prototype in 48 hours. My idea was a 3D printer that uses conventional yarns that are placed according to pre programmed path around the rigid elements that support the warp. After the weaving is done the rigid elements are removed from the structure, so that only woven structure remains. Isabel Berglund - Textile surface - identity. Isabel Berglund travels extensively with her work and has exhibited in Europe, Asia and the USA. Her work has been featured in numerous publications. 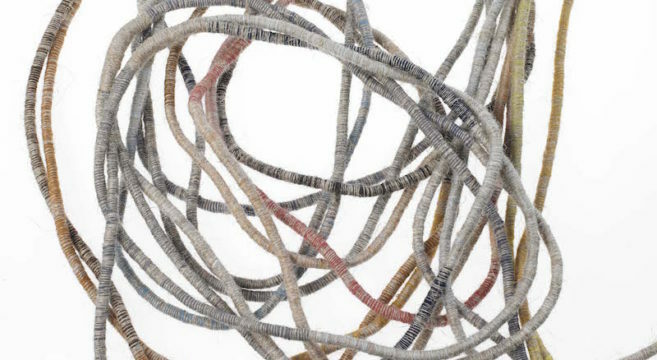 Isabel creates surprising, imaginative and often monumental works in hand-knit yarn. With this choice of artistic medium she reaches out to her audience with a familiar material and traditional techniques. In her artistic process, however, she transforms the traditional craft to create unusual, and often spectacular, objects to convey a symbolic image and to challenge our perception of reality. She combines elements from knitting with features from art and industrial design, adding deliberate twists in meaning. Her works have a sensuous, tactile character that invites people to reach out and interact with the objects. Throughout her artistic practice, her main themes are identity and surfaces, with the relationship between body and artwork as a key element. Her main source of inspiration is everyday life, people, words and objects, and she often rephrases and recasts mundane objects by combining them with a play on words or a novel conceptual framework. Kiyoshi Yamamoto - Conversation with Annie Albers. been acquired by The Norwegian National Museum for Arts, Craftsand Design in Trondheim, The National gallery in Oslo, KODE museum in Bergen and by the Norwegian Embassy in Brazil. Yamamoto is lately working in a series of large commission work for St. Olav Hospital in Trondheim Norway. Kiyoshi Yamamoto is also shortlisted to Sandefjord artist prize 2019. Du kan skriva till oss på "skandinaviska" eller engelska. Download the program prices included. The registration is open 12.12 2018 - 22.2 2019.